When you open the box of your new Samsung Galaxy S6, the packaging will present you with your phone, wrapped in plastic, readily accessible. If you haven’t already, take the phone out of the plastic bag and remove any protective covering material on the screen. First things first. The Power button is on the right side of the phone. You can see where in the following figure. Press the Power button for a second and see whether it vibrates and the screen lights up. Hopefully, your phone arrived with enough electrical charge that you won’t have to plug it into an outlet right away. You can enjoy your new phone for the first day without having to charge it. 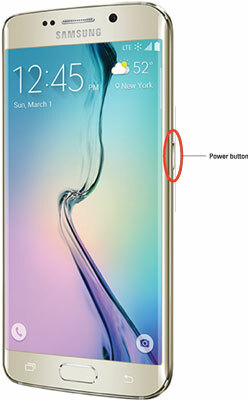 The Power button on the Samsung Galaxy S6. The phones that you get at the stores of most cellular carriers usually come with the battery installed, partially charged, and registered with the network. If the screen does light up, don’t hold the Power button too long, or the phone might turn off. If the phone screen doesn’t light up (rats! ), you need to charge the battery. Here’s the rub: It’s important to fully charge the battery for 24 hours, or at least overnight, so that it will last as long as possible. That means you have wait to use your beautiful new phone. Sorry.